Institution: U. Nebraska at Omaha and Boston U. 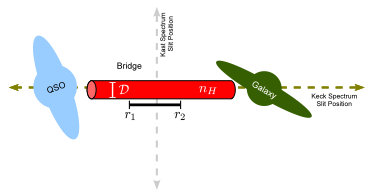 The basis for something called the “G dwarf problem” is the comparison between observations and a simple model for chemical evolution in a galaxy. To cut to the chase, there are fewer very metal poor G dwarfs than are predicted by this basic understanding. This discrepancy has been shown to hold for the Milky Way as well as for other galaxies. It also holds for K dwarfs in the Milky Way – and now for M dwarfs as well. Imagine the Milky Way evolving and forming stars without the infall or outflow of any material, in what’s commonly called a “closed box.” We additionally assume that 1) the galaxy initially had no metals at all, 2) the mass distribution of newly formed stars is always the same and 3) newly formed metals are uniformly mixed throughout the galaxy. Using just college calculus, we can find a simple model (appropriately called the “Simple Model”) that describes how the metallicity distribution of stars in a galaxy evolves. Okay, this is a pretty simple model. Can’t we make some reasonable modifications? It’s true, probably every assumption that goes into the Simple Model is false – but it’s a good starting point from which to explore the possibilities. Material can be accreted onto a galaxy, or blown off in a galactic wind. Massive stars that lived and died before the galaxy finished forming could contribute an initial nonzero metallicity. Perhaps early in a galaxy’s history, star formation preferentially produces more massive stars than it does now. While the distribution of metallicities can be better fit by more complex models, the G dwarf problem is representative of the ongoing effort to understand the evolution of our galaxy. But why do we care about M dwarfs? The main concern with using G dwarfs to explore the chemical evolution of our galaxy is that these stars only live to be roughly ten billion years old. That’s a long time, but not so long that some of the oldest G dwarfs could have evolved off the main sequence; this would remove some of the metal poor stars from the sample. However, K and M dwarfs have main sequence lifetimes longer than the age of the Universe and so are better tracers of galactic evolution. An analogous “K dwarf problem” has previously been demonstrated and now Woolf & West have shown that the M dwarf problem does, too. 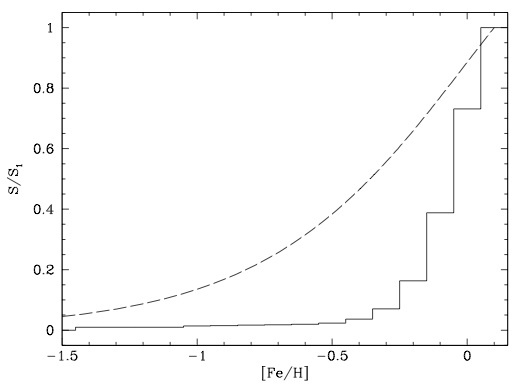 This figure plots the cumulative metallicity distribution of M dwarfs the SDSS spectroscopic sample, or the fraction of M dwarfs that have a metallicity less a certain value. The theoretical Simple Model is the dashed line, which falls off much more slowly the the data (solid histogram). Figure 3 from the paper. Last question: how do the authors measure the metallicities of all these stars? Woolf and West use spectroscopy from the Sloan Digital Sky Survey to measure metallicities by looking at the spectroscopic signature of three molecules. Two of the molecules trace the spectral type or temperature of the star; by considering an additional molecule, it is possible to determine a star’s metallicity. They also had to devote substantial effort to correcting for biases introduced by magnitude limits: intrinsically brighter stars can be seen out to larger distances than can intrinsically fainter stars and so are over-represented in the final sample. In addition, the more distant stars are also farther out of the galactic plane, where the total number of stars is naturally lower. When comparing the metallicity distribution of M dwarfs to the Simple Model, the authors conclude that “for all reasonable values the theoretical curve drops off much more slowly toward low metallicity than the observed curve does.” This comparison is shown in the plot to the right. Dissecting a Merger between a Quasar and a ‘Green Valley’ Galaxy Feeding on the Cosmic Web Mixing up gas in the wake of a strangled satellite A star with a fake ID?